NEW OPTION! 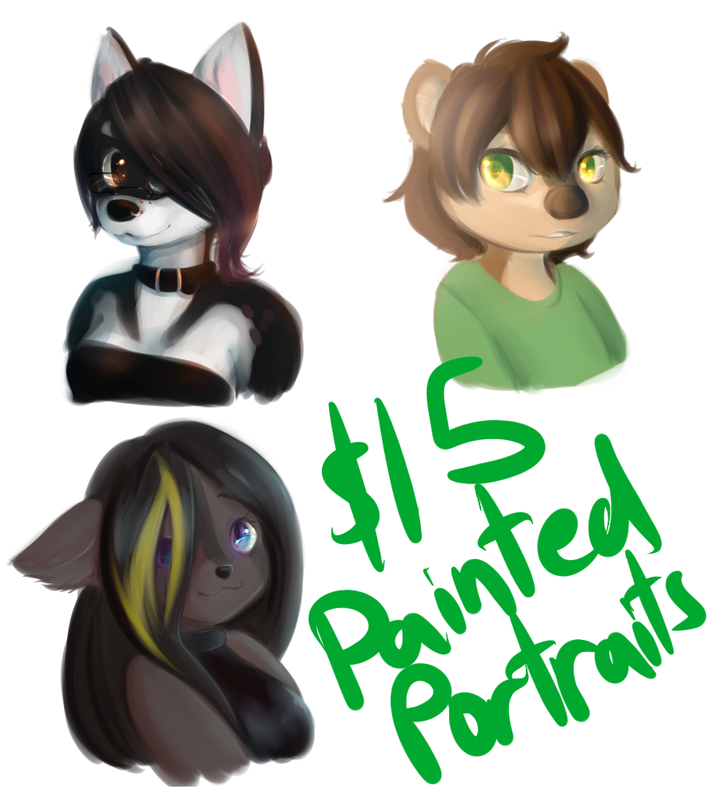 $15(+) PAINTED PORTRAITS! gasps with sparkly eyes. "I may try to git one at some point....I do need to update my fursona....must save $ spare for iiiit." got it ...I am doing alot of math so much cute I wana git from you and another artist XD so it helps to have a total I need to gather worked out. <: you can take your time! pritty much Valentines day is coming up...heh beloved is simpel as heck to draw I think.......pure white otter that he is with angel wings blue eyes and a black nose....me I sapose not so much....but matching little Portrait things would be cute. I normly dont do that kind of thing evin thow we'v bin together for years but idk. that being said to do this would proby run around $35 to $45 with you given I don't know what a heart or something lil back ground would be. but itd be like those corny lil haf heart necklaces ir a locket opened. 2 separate ones but hint at being together... when viewed together. matching portraits would be a really cute idea! Just tell me when you manage to do that xD! when I can do what?..pay pal? I haf to set it up. at least it's 3 to 5, and not 5 to 7 like here! heh it is still ridiculous when I do not trust pay pal. <: I've been using it for years. so have others...apparently I should never have a large amount held on there. or they will close my account because they can they dont haf to give a resion you agreed this was ok when you signed up.....and they take you money when they do this. O: I've never hand any trouble with it, but I guess it's not a bad thing to be careful. :D That's a good idea! C: Just send me a pm containing refs(or detailed description) and I,ll add it to my list! well there is one for me and there is one I am giting as a gift for Beloved I'll have him pm you with his description and I mine? he is ...oh I'll have him comment here. ::blinks softly:: I'm here, beloved. i can try.. the pic i have is a good reference of my fursona, just with minor tweaks..